← Barents Stories: How do we see the sea? About the intrigues around this year’s celebration and why they reminded me of one of the darkest chapters of Sámi history. Walking by the “forbidden zone” of the Murmansk Regional Administration building during the Sami Day celebrations on 6 February 2014. All photos with courtesy of Kola Sami Radio. 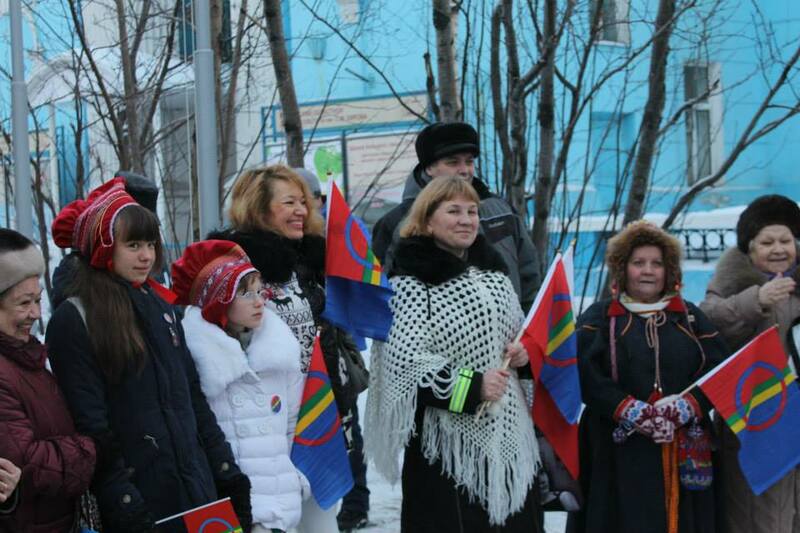 For this year’s Sámi National Day I happened to be in Murmansk and I witnessed the celebrations, which were preceded by some red hot intrigues. The day traditionally starts with the raising of the Sámi flag. In Murmansk this year this happened at three different places. First at the Norwegian Consulate, then at the Centre for Indigenous Peoples, and finally near the Seamen’s house. Though the official flying of the flag was, for this purpose, sanctioned by the Russian authorities even in two places, both locations were in side streets with almost no people around. How come? Well, the vacant flag pole near the Russian flag pole at the so-called White House, the Murmansk Region’s Government building (which in fact is yellow) and the most representative place downtown, had to be urgently removed shortly before the celebrations. Why? Because it happened to be unstable and thus represented a threat to the security of passers-by. So the administration kindly offered to the Sámi community the two alternative settings, both located in far less busy places where public attention (and therefore the risk of injury by falling flag poles, too) would be minimal. Among the organisers of the Sámi Day celebrations nobody believes the story of the unstable flag pole, although they acclaim the officials for their creativity. And many argue: Isn’t it rather another “threat” which seems to motivate the Region’s administration? A nation of 1599 people (according to the 2010 census) raising their flag near a symbol of Russian state power seems to be something very frightening to some. The question of where to raise the flag had been in fact an issue in the regional parliament even before they noticed the shaky flag pole. In a discussion one member of the dominating Edinaia Rossiia party said that one should not allow such things because once one minority has been granted the right to make the colours, all the other minorities might follow and claim their right to raise their flags too. This seems to be an inacceptable scenario to the ruling power of the multi-ethnic state of Russia. It is definitely realistic that fears of separatism, although not (yet) explicitly uttered, can be exploited in the politics of local government members. The case of alleged Pomor separatism isn’t closed yet, and to incriminate the Russian Sámi for having strong ties to their co-brothers and allies abroad might be even easier than in the case of the Pomors. Moreover, the eager search for hints of separatism, even the most inconspicuous ones, has a long-lasting tradition. If we go further back in history, the situation with the flag pole reminds me of the ridiculously irrational “Sámi complot” during the Stalin Era. In 1938 the NKVD fabricated the so-called Sámi nationalist counterrevolutionary conspiracy. In the setting of the orchestrated class struggle, which had to take place even in the remotest corners of the country, a group of people had been “uncovered” while allegedly preparing an uprising in order to create a “Lappish Republic” which should become a part of Finland. Its leader became Vasilii Kondrat’evich Alymov, who was not a Sámi. He was a scholar from Leningrad who, in earlier years, had been living among the Sámi and in Murmansk collecting materials for a Sámi dictionary. Being an intellectual with strong ties to the local indigenous population and yet an outsider, and having served for the Mensheviks, he proved to be the ideal figure of an inciter. The whole inquiries of case No. 46197 lasted for a very short period: from 27 February till 7 April 1938. 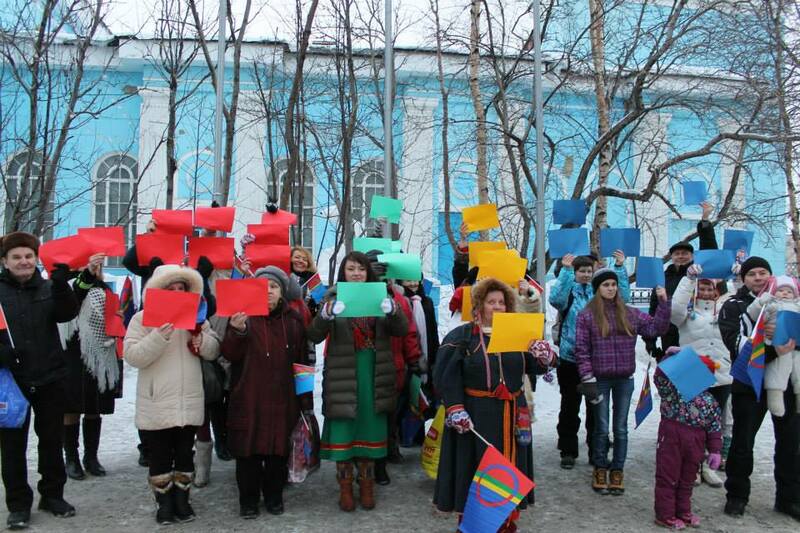 As a result, 34 people, mostly Sámi, were arrested. Among these, 15 were shot and 13 sentenced to long labour camp terms. All of the convicts had compromised themselves by totally picayune deeds or life events which dated far back, like serving in the tsarist army. A detailed account of these events has been written by Aleksei Kiselev, one of the most famous local historians. Allowing to raise the Sámi flag near a main symbol of state power (as it happened on the territory of the Norwegian consulate) would have been a nice sign of respect and reconciliation towards the local indigenous population, which had to suffer a great loss of ethnic identity as well as life and material losses during Soviet times. The chance has been missed. Preparing for the flashmob near the Seamen’s House. 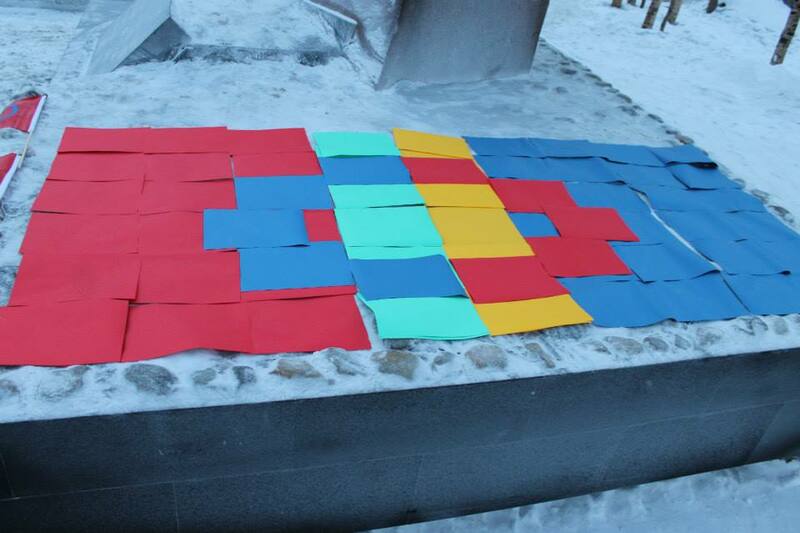 The “retaliation measures” by the Sámi activists have been astonishingly peaceful and colourful: The flashmob, which had been organised using the social media, had the aim to create a “living” Sámi flag. They preferred not to act illegally and stay at the officially sanctioned place near the Seamen’s house, and therefore the location and the attention by passers-by were not really great. The circle in the flag, unfortunately, didn’t work out too, but the idea was positive and beautiful. It was in the (at least Eastern) Sámi-like spirit of a soft and peaceful resistance. 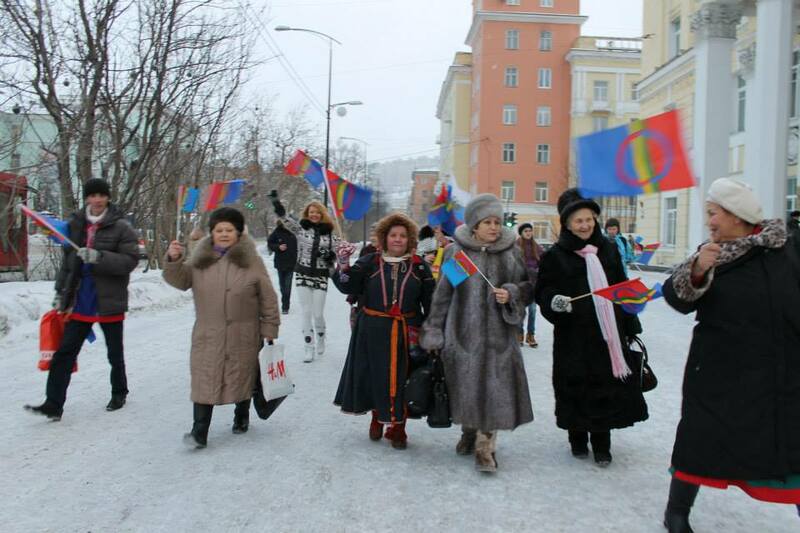 The living Sami flag of Murmansk. This entry was posted in Announcements, Fieldwork, Indigenous Peoples, Russian North, Sámi and tagged activism, Anthropology of the North, Arctic Social Sciences, Barents region, circumpolar North, indigenous people, Kola Peninsula, Lapland, media outreach, Murmansk. Bookmark the permalink.